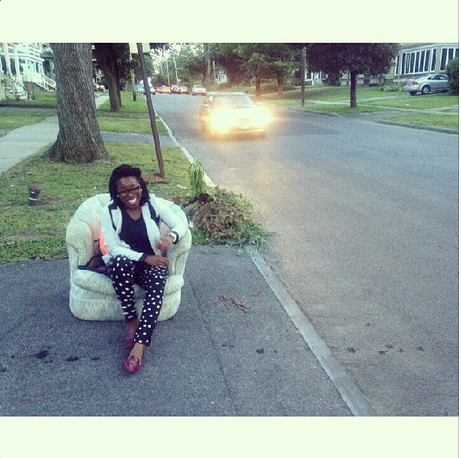 On our way home, my friend (who will remain nameless) spotted a couch on the sidewalk in front of a house. The owner saw us admiring the cute design and yelled from her window that we should feel free to take it. At this, my friend got excited and attempted to lift the couch. We then realized that we were about 3 to 4 blocks away from our neighborhood. At the thought of dragging the couch all the way down the street, I had already resigned, in my head, to leave it where we found it. A kind stranger walked by and suggest, half in jest, that we hoist the couch upside down on my bike and wheel it down the street. We had no other option, so off we went, down the street with our curb shopping spoils. We received many stares and glances. All the while, I reminded myself that I was doing a favor for a friend and tried not to think about how my friend had even convinced me to transport the couch in the first place. 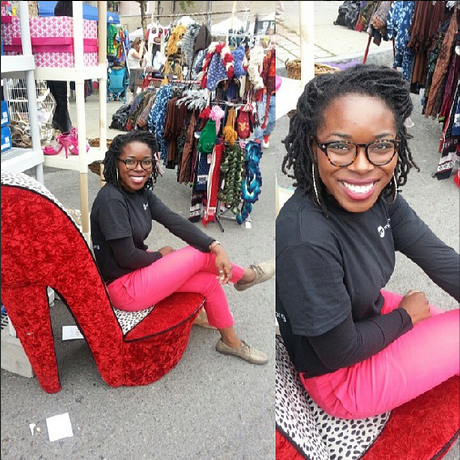 This fabulous high heel chair was spotted at the Westcott Street Fair in Syracuse this weekend, in front of the Boom Babies store. It’s funky and retro. It would make a fun personal chair to brighten up the color of a room. This chair was a hard plastic chair in the shape of a hand that we found in front of a consignment shop. Something about it made me feel like a little kid and I had to sit on it. 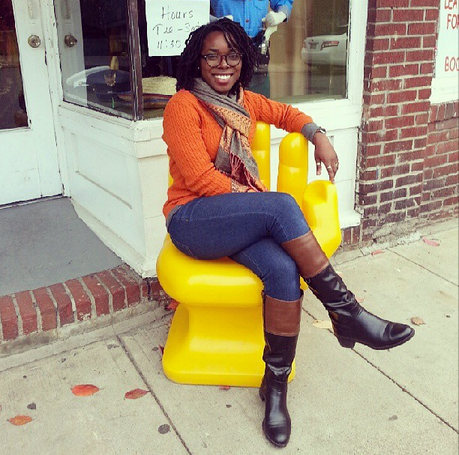 I’m not sure how I found so many cool chairs this past week, but it made me feel like Goldilocks. Of all the 3 chairs we saw, we only took the couch (chair #1) home. The other two belonged to the stores.